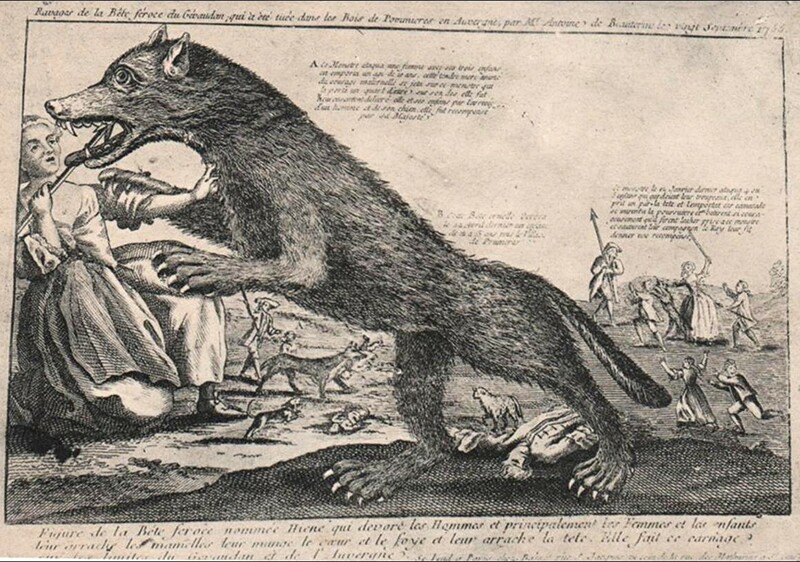 ShukerNature: THE BEAST OF GÉVAUDAN - WOLF, MAN...OR WOLF-MAN? 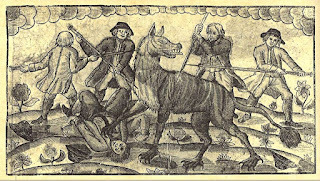 Between June 1764 and June 1767, a hideous series of killings, as grisly as they were plentiful (somewhere around 80 to 113 human victims, plus many injured survivors), occurred in a village-speckled district of Lozère, southeastern France, called Gévaudan. Their perpetrator became known as the Beast of Gévaudan, but more than two centuries of speculation have failed to stem the controversy regarding its precise identity. Just what was this Beast? An animal? A man? Or something more? Its first recorded victim was Jeanne Boulet, a 14-year-old peasant girl from the mountain village of Saint Etienne de Lugdares, who was slaughtered on 30 June 1764 while tending a few sheep and cows on the hills of the Vivarais. Some villagers discovered her corpse - minus its heart, which had been savagely ripped out of her body. 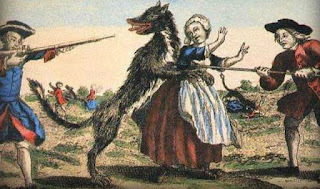 Many other victims followed, most of which were women or children, whom the Beast attacked by springing at their throat. Some were subsequently devoured, others were simply torn apart in a frenzy of insatiable blood-lust, with decapitation and dismemberment occurring on a regular basis. Those that survived often claimed that the Beast gave voice to a loud horse-like neighing or laugh-like cry, had hind legs longer than its forelegs, and a conspicuously large head. During its three-year reign of terror, the Beast was hunted by countless people and parties. 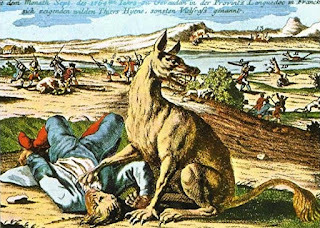 Notable among these was Jean-Baptiste Duhamel, a dragoon captain stationed close to Gévaudan, who took charge of the hunt for the Beast in early November 1764, launching a massive search for it that featured over 20,000 participants, but all to no avail. 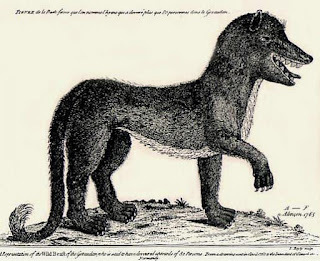 By February 1765, the Beast had attracted such widespread attention in France that King Louis XV personally became involved in the pursuit of this rapacious phantom - sending to Gévaudan one of his country's most renowned hunters, Jean Charles Marc Antoine Vaumesie Denneval (d'Enneval), equipped with six of his most efficient bloodhounds, but like Duhamel he failed to achieve any success. Having said that, on several occasions the Beast's pursuers had encountered a huge wolf-like beast actually in the process of attacking its victim, but even though they had shot the creature it had always managed to escape - seemingly wounded, but never fatally. This apparent invulnerability to gunfire inspired many priests and other religious men to deem it a supernatural entity, a non-corporeal embodiment of evil that could not be destroyed by conventional means. Some even claimed that it had been sent as a punishment for humanity's own evil. Then came the shooting of 21 September 1765. The king's personal gun-carrier, François Antoine (aka Antoine de Beauterne), had been tracking the Beast throughout that day in the woods near the village of Pommier, accompanied by 40 local hunters, when without warning their quarry appeared at the bottom of the Béal Ravine. It was shot several times, finally dropping down dead as it attempted (yet again) to escape. It appeared to be an enormous black wolf Canis lupus - measuring around 6 ft long, standing 32 in high, and weighing 143 lb, equipped with a formidable pair of 1.5-in-long fangs and 40 teeth in total. Interestingly, wolves normally possess 42 teeth, and some scholars have suggested that this Beast might have been a wolf-dog hybrid, rather than a pure-bred wolf. Dubbed the Wolf of Chazes after the nearby Abbey of Chazes, its stuffed corpse was exhibited at the king's court for a time, before being transferred to Paris's Museum of Natural History, where it was retained until the early 1900s (what happened to it then is currently a mystery) - but the killings did not stop. True, there were no published reports, but this was on the express order of the king, who was anxious to contain the panic that this macabre epidemic of murders since June 1764 had generated. Eventually, however, news of the continuing series of deaths could no longer be suppressed - and the rest of France learnt to its horror that the deadly Beast of Gévaudan (or something else behaving very like it?) was still alive. 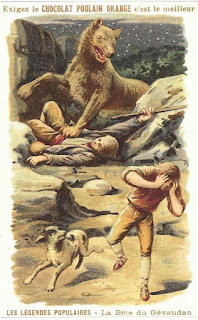 Several creatures suspected of being the Beast were dispatched over the next two years (while identities suggested then and since for this terrifying creature ranged far beyond dogs and wolves, to embrace such exotic escapees as lions, tigers, black panthers, baboons, wolverines, and hyaenas). 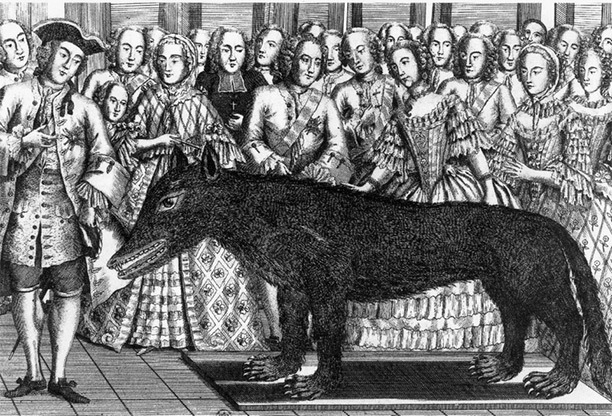 Nevertheless, it was not until 19 June 1767 that the Beast's hideous onslaughts were finally halted for good. 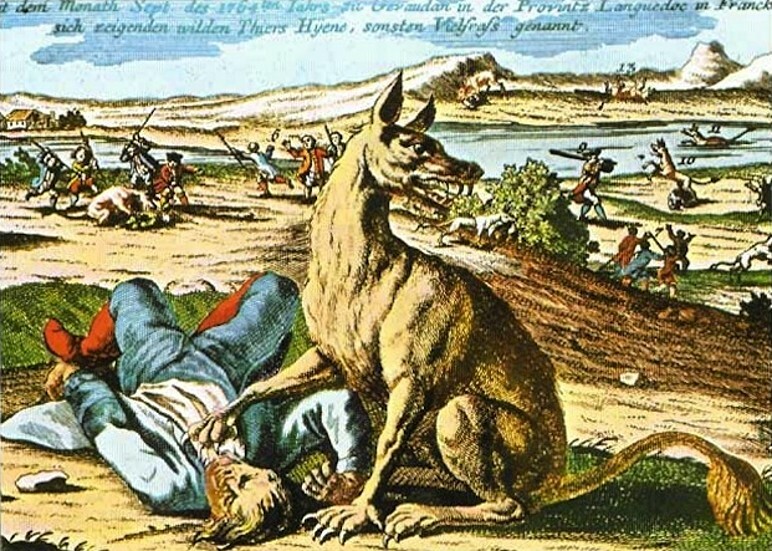 This was when, during a hunt organised by the Marquis d'Apcher, a huge dog-like creature was shot dead at Mount Chauvet by local hunter Jean Chastel after it had slowly emerged from a thicket. 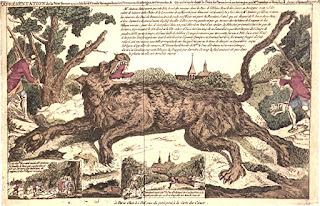 The Beast's carcase was autopsied by the king's notary, Roch Etienne Marin, but no definite identification was reached, although Marin did opine that if this daunting creature were a wolf, it was an "extraordinary one, and quite different by its form and proportions from wolves seen in this land". Interestingly, moreover, according to a list of dimensions and other features compiled by Marin, which was rediscovered in 1958 after having long been thought lost, the creature possessed 36 teeth (i.e. six fewer than a wolf, but only two more than a hyaena). Afterwards, the carcase was stuffed and exhibited for a time in a number of villages before being taken to the king, but by then it had begun to decompose, so it was supposedly buried in an unmarked location somewhere within the huge garden of the king's castle. This would have been a great tragedy if true (but it wasn't – see later), because some accounts indicated that the creature's unusual appearance was by no means confined to its great size. 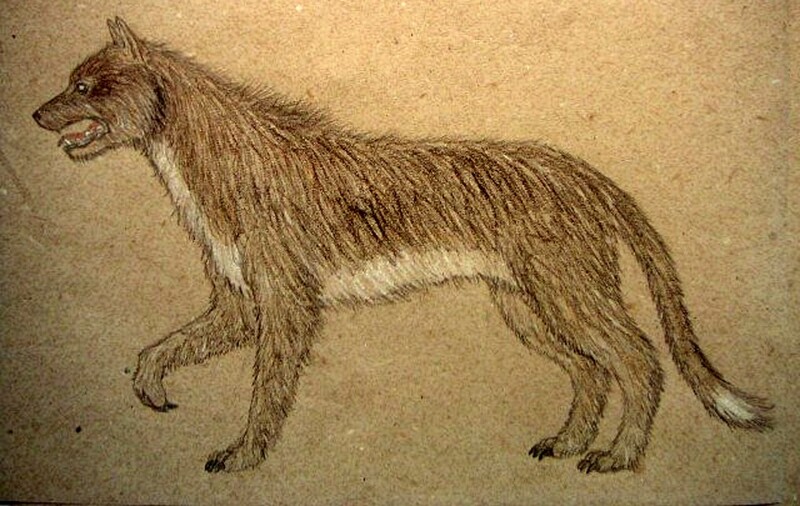 Reported descriptions and contemporary depictions of the Beast's pelage varied greatly. According to certain ones, it was reddish, according to various others it was blackish, with (or without) a white patch on its chest (or even a long white ventral stripe), mottled or brindled elsewhere, and with a dark stripe running down its back. Moreover, its feet were said to bear very long, sturdy claws, which in some accounts were even likened to hooves. 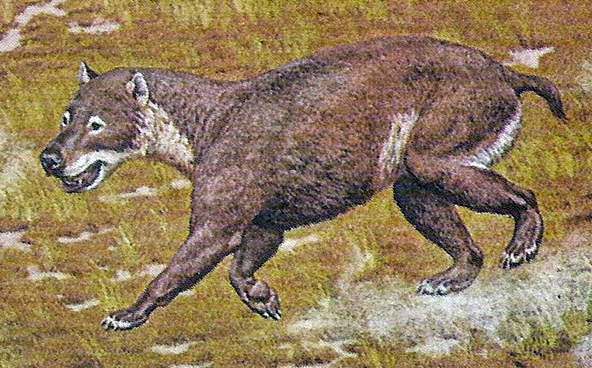 This latter claim concerning hooves has in turn led to a very extreme identity for the Beast having been offered by several online cryptozoological enthusiasts – namely, a surviving mesonychian, or, more specifically, a modern-day representative of Andrewsarchus mongoliensis, the largest carnivorous land mammal presently known to science. Mesonychians constituted a taxonomic order of early carnivorous ungulates that according to the current fossil record existed from the early Palaeocene to the early Oligocene (approximately 63 to 30 million years ago), although most had vanished by the end of the Eocene. They are believed to have originated in Asia, where they were very diverse, but subsequently radiated out into Europe too, as well as reaching North America - where they evolved into some huge forms. However, they were eventually out-competed by the emerging true carnivores or carnivorans, i.e. belonging to the order Carnivora (dogs, cats, bears, mustelids, hyaenas, viverrids, etc). Yet despite being carnivorous, predatory creatures, because they were ungulates the mesonychians possessed hooves, not claws, which is what inspired the mesonychian identity for the Beast of Gévaudan. However, not only would the survival of a mesonychian lineage into the present day require them to close a very sizeable 30-million-year gap in the fossil record (thereby constituting a truly outstanding example of a Lazarus taxon), it would also mean that with the exception of the Beast's relatively brief period of depredation, such distinctive animals had somehow remained entirely unknown both to science and to local people in France throughout historical time there. Needless to say, all of this seems highly unlikely – and even more so when applied to a putative modern-day Andrewsarchus. Known only from a single fossil skull unearthed at a Gobi Desert site in 1923, but which measured a colossal 32.8 in long and 22 in wide, if this monstrous mammal were proportioned in the same manner as typical mesonychians, it would have attained an estimated total length of around 11 ft. However, although long deemed to have been a mesonychian, it has recently been reclassified by many palaeontologists as a carnivorous artiodactyl (even-toed ungulate) instead. 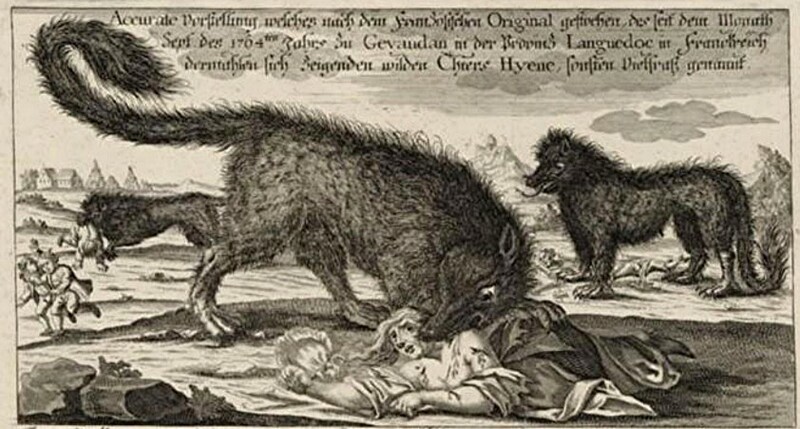 Nevertheless, it goes without saying, surely, that if an Andrewsarchus lineage, even one of smaller body stature than its original Mongolian antecedent, were surviving somewhere in the French countryside, its presence there would certainly not have gone unnoticed during all of the centuries preceding and following the Beast of Gévaudan's triennium of tyranny. The same also applies in relation to the theory put forward by Pascal Cazottes in his book La Bête du Gévaudan: Enfin Démasquées? 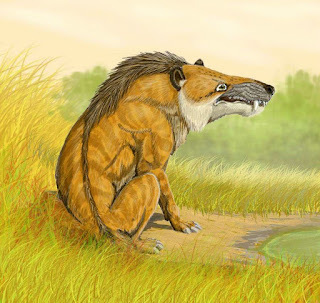 (2004), that the Beast was a surviving species of Hemicyon – a member of the prehistoric dog-bear or hemicyonid family of carnivorans (not to be confused with the prehistoric bear-dog or amphicyonid family of carnivorans) that flourished for between 17 to 11 million years during the Miocene epoch before dying out at its close, approximately 5.3 million years ago. Sporting tiger-like proportions and a somewhat ursine form but a dog-like dentition, Hemicyon also ran in a digitigrade manner like dogs, rather than plantigrade like bears. Whether it would have resembled the Beast of Gévaudan, however, is another matter entirely. 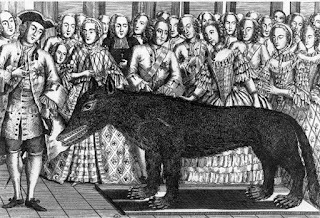 In any case, during summer 1997 taxidermist Franz Jullien from France's National Museum of Natural History in Paris showed that the story of the second Beast's carcase having been buried was untrue (as was the claim that it sported hooves). 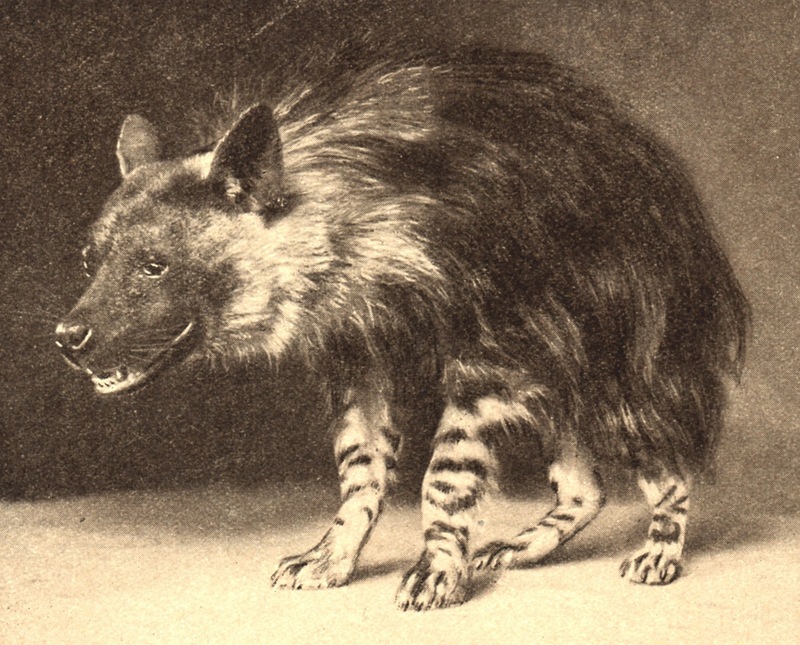 For that was when he publicly announced his recent discovery in the museum of an old guide which sensationally revealed that this specimen had actually been exhibited there until at least 1819 (what happened to it afterwards, however, is unknown), and that during this time it had been conclusively identified – as a striped hyaena! Interestingly, a hyaena had long been favoured in the Gévaudan area as an identity for its nightmarish Beast, and could explain anecdotal accounts of its laughing cry, its large head, and hind limbs larger than forelimbs, but until now there had been no firm evidence to support it. Jullien published details of his significant find in the August 1998 issue of the journal Annales du Muséum du Havre. 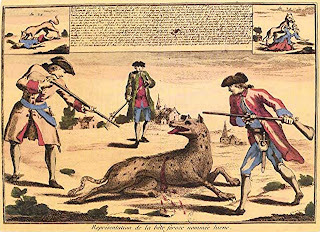 As this particular hyaena species, Hyaena hyaena, is native to Africa and Asia but not to Europe, it was evidently an escapee or deliberate release from captivity - and it is a nothing if not interesting coincidence that Antoine Chastel, one of the two sons of hunter Jean Chastel who killed this second Beast, allegedly possessed a striped hyaena in his personal menagerie. According to a variation upon this claim, Antoine worked as a caretaker in the menagerie of exotic animals owned by a local aristocrat, the Count of Morangiès. 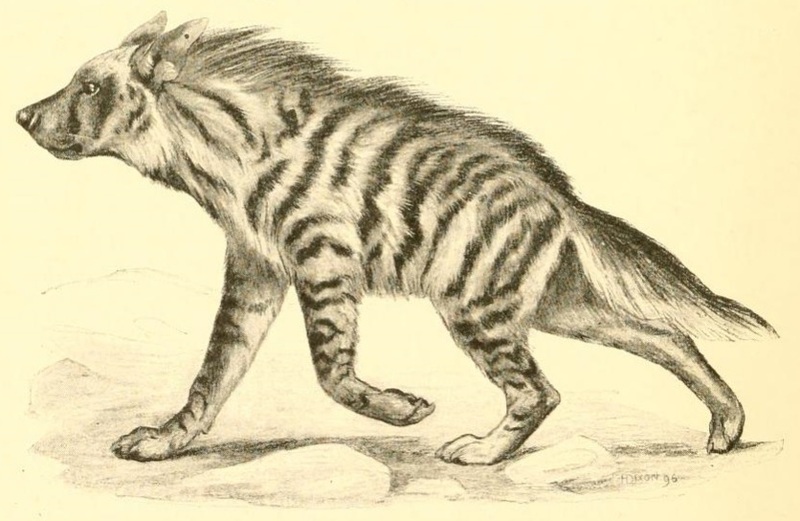 Either way, however, there would seem to be a tenable origin for a striped hyaena on the loose in this specific region of France at the time of the Beast's onslaughts. The fundamental problem here is that normally the striped hyaena is a scavenger, not an active hunter, but perhaps a rogue or rabid individual might be, or one that had been deliberately trained to attack and kill people – see later here. 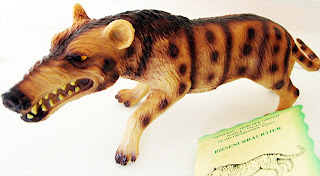 Also worth noting is that only hyaenas have the jaw strength to bite clean through bones (their bite force even exceeds that of lions), and thereby perform the decapitations and limb shearings ascribed to the Beast; wolves cannot normally do this. Of course, hyaenas have fewer teeth (only 34) than the 40 claimed for the first shot Beast, but as this latter animal seems very likely to have been a wolf or wolf-dog hybrid (there does not appear to have been any suggestion that this too was a hyaena), that discrepancy is not a problem. A hyaena trained to kill (by Jean Chastel, no less – see later for much more regarding this line of speculation) was the Beast identity pursued by cryptozoologist Ken Gerhard, investigating the Beast of Gévaudan saga alongside criminal profiler George Deuchar in an episode of the History Alive television documentary series entitled 'The Real Wolfman', which was screened by the History Channel in October 2009. However, the species put forward here was Africa's little-known brown hyaena H. brunnea, which seems a somewhat unlikely creature to have been held in captivity in 18th-Century rural France, and is not as potentially savage as the larger striped and (especially) spotted hyaena species anyway. (Consequently, when I originally uploaded this article of mine here on ShukerNature, I was puzzled as to why the programme's 'powers-that-be' had decided that this species should be the one for Ken and George's investigations to focus upon, rather than either of the other two hyaenas, but after reading it Ken informed me that the reason was that the producers had felt that the brown hyaena was the most wolf-like hyaena species – thanks for this information, Ken!) 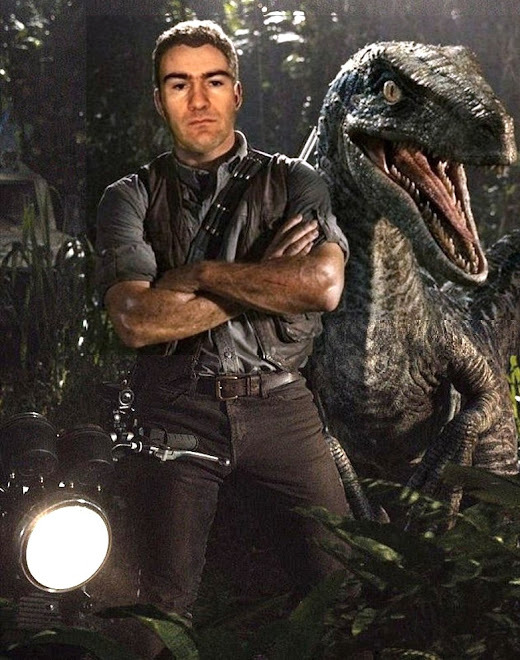 Irrespective of such considerations, however, the programme made compelling viewing, with Ken readily demonstrating his cryptozoological acumen. 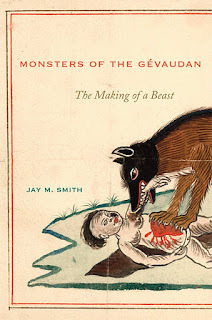 In his extensive study of this saga, Monsters of the Gévaudan: The Making of a Beast (2011), University of North Carolina historian Prof. Jay M. Smith concluded that the Beast attacks were the collective activity of several different creatures, all of which were wolves, and that much of the terror gripping this region of France at the time had resulted from the uber-hyped, tabloid-style manner in which the saga was presented in the media, so that it was as much a social, cultural phenomenon as a cryptozoological one. Yet even if the latter aspect were true, as noted above wolves alone would be unlikely to achieve the bone-shearing massacres accomplished by the Beast. Whatever its identity, however, the Beast of Gévaudan is by no means unique in the annals of French history, as the following selection of examples amply demonstrates, featuring some notorious episodes of lupine aggression. 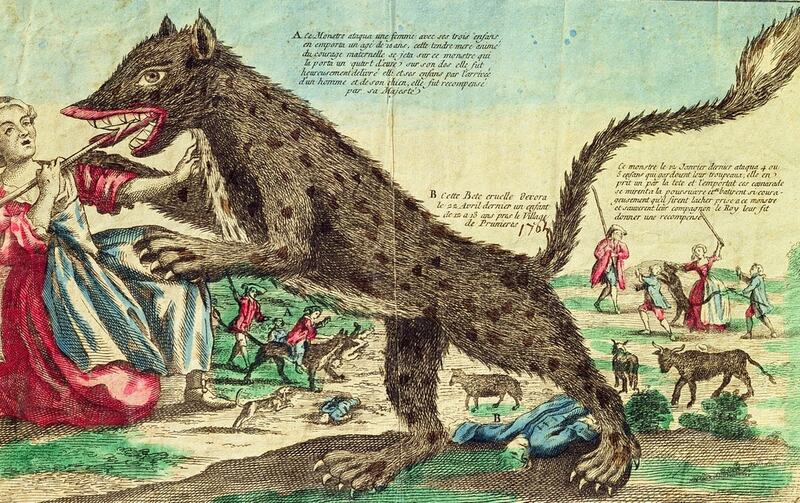 Back in 1632, a bloodthirsty precursor to the Beast of Gévaudan allegedly frequented the Forest of Cinglais, from which it would periodically emerge to attack and kill people inhabiting a same-named village nearby (it was blamed for the deaths of over 30 people). The village of Cinglais was situated three miles south from the city of Caen, capital of Lower Normandy in northwestern France. 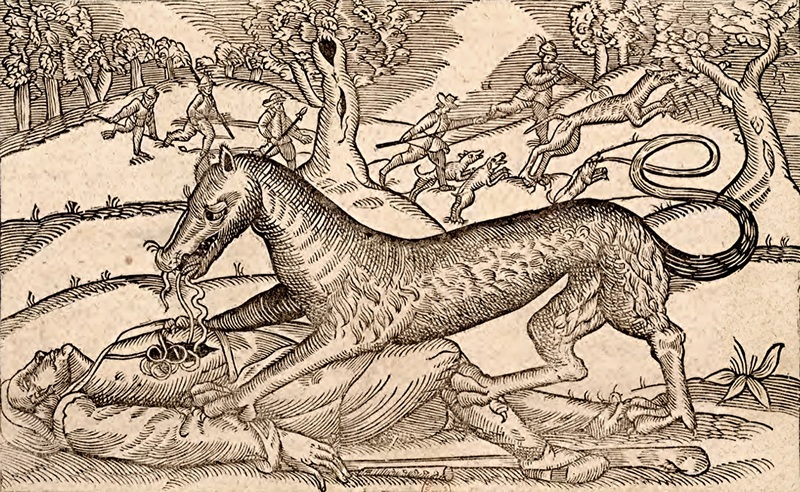 During a gigantic hunt beat held in June 1633 and featuring 5000-6000 male participants, however, a large and very swift, agile animal subsequently identified as a wolf but with red fur was shot dead, after which the killings ceased. 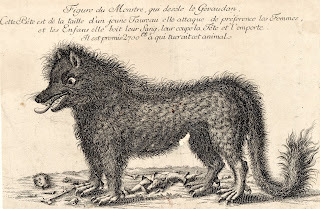 Reports of marauding wild animals believed but never conclusively confirmed to be wolves have also emerged from many parts of France in the centuries that followed the demise of the Gévaudan-based Beast phenomenon (even though the wolf is nowadays virtually extinct in this country). As discussed by Véronique Campion-Vincent within an article from 1992 in the journal Folklore, explanations proffered by the authorities, the general public, wildlife experts, and investigators of specific cases have varied greatly - from natural migration or covert, human-engineered introduction of wolves into France from bordering countries; and deliberate release of captive specimens purposefully to kill farm creatures, or simply because they were no longer wanted by their erstwhile owners; to the accidental escape of menagerie and circus specimens, or exotic pet wolves maintained in private homes. 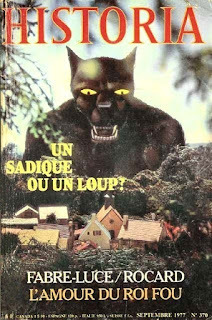 Thus, when two wolves were shot in a scarcely-populated pine forest in South-West Landes during 1968, investigators speculated that they may have been deliberately (but unofficially) introduced there from outside France by person(s) unknown. Deliberate release was a popular explanation for the presence of two wolves not far from Paris during 1972 - one of these was killed following a serious spate of livestock kills in the area. 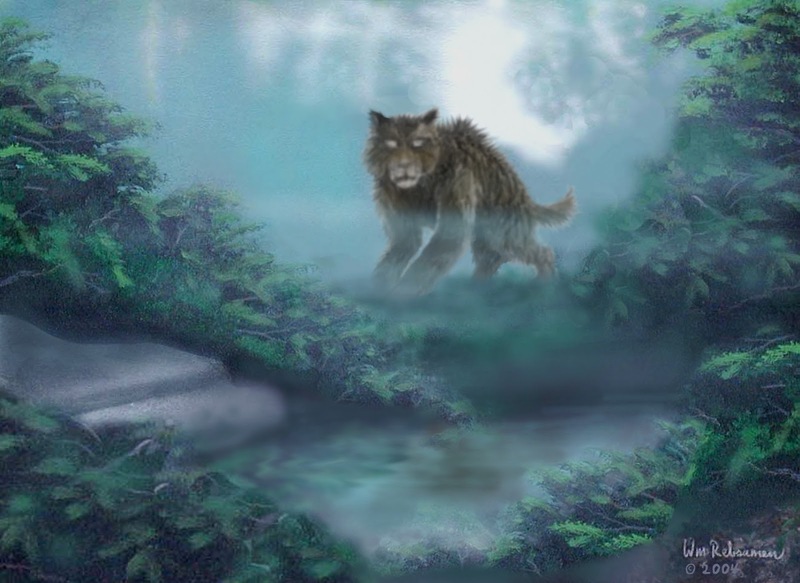 Two of the most notorious 20th Century cases on record, however, are those featuring the Beast of Cezallier and the Vosges Beast. During the 1940s, outbreaks of sheep slaughter in the environs of Cezallier, central France, regularly hit the newspaper headlines, inciting very appreciable discussion and dispute regarding the likely perpetrator of these killings - due in no small way to the remarkable variety of descriptions recorded for the alleged creature(s) in question. 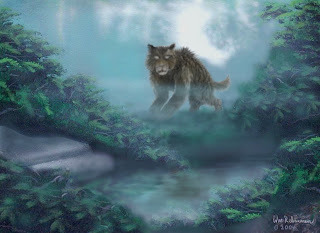 According to some eyewitnesses, the infamous Beast of Cezallier was definitely some type of big cat, variously resembling a lioness or a panther; others, conversely, were adamant that it was not feline but canine in form - undoubtedly a wolf or a very large feral dog. 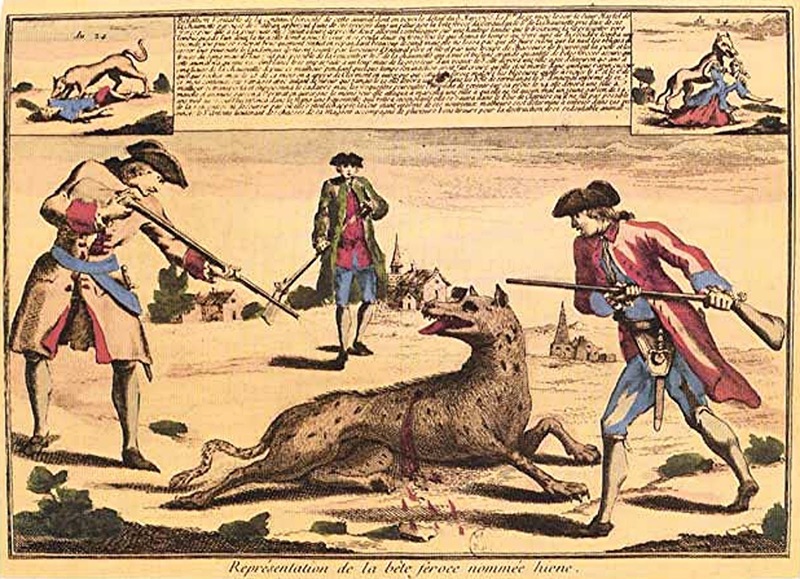 The controversy continued throughout the 1940s and seemed set to do the same in the 1950s - until 1951, that is, when a bona fide wolf was shot near Grandrieu in the Upper Loire region, and the killings stopped. The dead wolf was duly dubbed the Beast of Cezallier, and the mystery was deemed officially solved - but it seems rather unlikely that eyewitnesses could confuse a creature so overtly dog-like in form as a wolf with lionesses or panthers. Quite probably, the wolf was only one of several culprits collectively responsible for the heinous deeds of the Cezallier Beast. History repeated itself during the late 1970s, but this time in the vicinity of Vosges, which experienced a near-epidemic of livestock killings, beginning on the Lorraine plateau near Rambervilliers, but progressing with the passing months to the Bresse highlands, and involving a horrific tally of death encompassing 31 different farms and collectively featuring more than 300 slaughtered or wounded sheep, three cows, a foal, and four dogs. Numerous organised hunts and searches were instigated, but their mysterious quarry eluded all of them. Then, after months of fruitless pursuit but regular Beast-blamed deaths, the killings suddenly ceased. The Beast was gone - or at least its blood-lust had been quelled - for it was never heard of again, and sheep could graze safely once more in the farmlands of Vosges. Yet however disturbing the mystery attackers of Vosges and Cezallier may seem, we must remember that their victims had been sheep and other animal livestock, not humans. 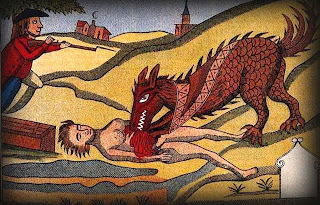 As a consequence, some researchers feel that there was far more to the homicidal Gévaudan Beast than an assortment of ravaging (even rabid?) wolves. In Africa, gruesome murders have been committed by the infamous leopard-man cults - secret societies who perform their terrible crimes masquerading as leopards, slashing their victims after the fashion of these great feline killing machines. Might something analogous have occurred in Gévaudan? 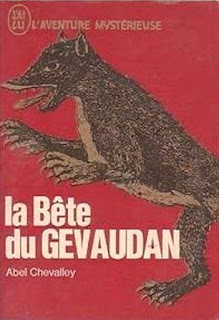 Thus it was, for instance, that in his classic study La Bête du Gévaudan (1976), Gérald Ménatory promoted the possibility that much of the Gévaudan carnage was the work of one or more human serial killers - capitalising upon genuine Beast-engendered deaths to wreak their own murderous mayhem in secure anonymity – and concentrating in particular upon the idea that Antoine Chastel utilised a pet hyaena in nefarious activity of this kind. The following year, in September 1977, a comprehensive 12-page article devoted to the 'human sadist' theory for the Gévaudan Beast appearing in monthly French magazine Historia. 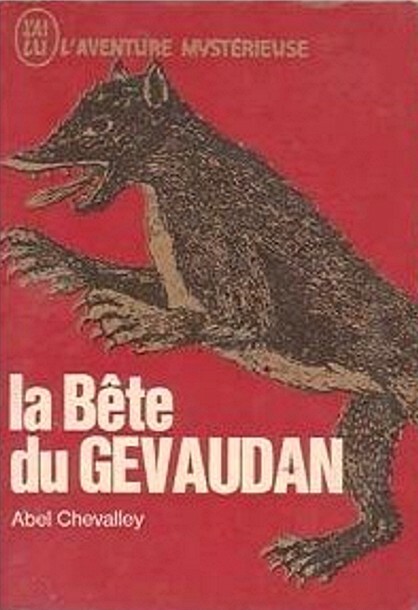 And during the mid-1980s, veteran French cryptozoologist Dr Bernard Heuvelmans, a disciple of Ménatory's theory, stated that he had no doubt that it was the correct explanation for the Gévaudan Beast's crimes. This disturbing notion and variations upon it have attracted considerable interest in more recent times too. In 2004, the Australian-made TV documentary series Animal X (which examined a wide range of cryptozoological subjects) screened an episode devoted to the Beast entitled 'Monster or Murderer'. In it, the identity that was put forward once again echoed Chevalley's scenario, inasmuch as the Beast was perceived to have been a trained wolf-dog assailant. A version of Ménatory's theory resurfaced in 2009, featuring the Beast as Antoine Chastel's hyaena, specifically trained by him or his father to attack people in order to cover up their family's sadistic serial killer activity. This, the theory argued, would thereby explain how Jean Chastel was able to shoot the second, hyaena-identified Beast so easily – i.e. after emerging slowly from a thicket, it neither attacked nor ran from him because it knew and trusted him. There is no doubt that the Chastel family had a bad reputation in the Gévaudan area at the time of the Beast killings, with Jean Chastel viewed by suspicious locals as a witchcraft-practising hermit and Antoine whispered to be a lycanthrope (see below), but was their reputation for dark deeds justified? In his several Beast publications, modern-day French author Guy Crouzet emphatically declares that wolves were solely responsible, rejecting any involvement of the Chastels. On the contrary, he claims that because of their eccentric, reclusive lifestyle, the family had been used by the authorities as convenient scapegoats for the Beast's activities, destroying their reputation in the certain knowledge that they lacked the power or political clout to retaliate. A noteworthy variation upon this theory postulates that Jean Chastel was definitely innocent of the witchcraft/serial killing claims, but that he purposefully trained some powerful, potentially ferocious creature to be a homicidal monster in order to revenge himself upon his reputation-blackening neighbours, priests, and the world at large. 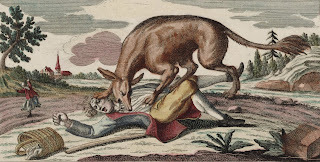 Then again, it is nothing if not intriguing to note that during the search for the Beast by François Antoine and his party back in 1765, one of his men almost met his death in some marshes due to a malign prank played upon him by none other than Jean Chastel, Antoine Chastel, and Antoine's brother. As a result, François Antoine ensured that all three Chastels were imprisoned. So there was definitely Beast-engendered bad feeling among the Chastels, thus making it all the more ironic (or suspicious?) that of all people it should be Jean Chastel who shot the second Beast in 1767. Could it be, therefore, that the first Beast killed was the real Beast of Gévaudan, and that the second one, the hyaena, was trained and released specifically by the Chastels to rampage and cause mayhem and hysteria as their revenge for their treatment by the first Beast's hunters? Developing further this Chevalley-inspired theory of Chastel culpability in the Beast events, Jean Chastel is claimed by some modern-day investigators as quite possibly not only having trained but also having actually created the original Beast. 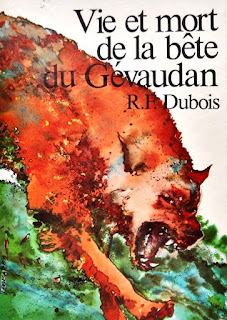 In his book La Bête du Gévaudan: L’Innocence des Loups (2000), French naturalist Michel Louis proposed that the Beast's supposed red pelage was the result of its having been sired by a red-furred mastiff (a dogue de Bordeaux?) 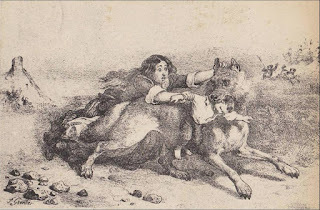 owned at that time by Chastel, who allegedly mated the mastiff with a female wolf to create a vicious slaughtering monster. Such a hybrid would be an exceedingly formidable (and morphologically bizarre) beast, certainly – more than enough, in fact, to confuse and terrify anyone who encountered it. A different take on the human killer theory was offered in a June 1980 Science et Vie article by French cryptozoologist Jean-Jacques Barloy. Mindful of the intense rivalry existing between Protestants and Catholics amid the rural Gévaudan area at the time of the Beast killings, he suggested that perhaps those occurring after the first Beast was shot were caused by Protestants releasing huge dogs and/or a hyaena upon the Catholic peasantry there. Returning to a Beast-Chastel link: one claim that surfaced many times throughout the Beast saga was that this uncanny creature seemed immune to bullets, having been shot at directly on a number of occasions yet without appearing to suffer any injury. An ingenious explanation for this alleged impenetrability was offered by R.F. Dubois in his book Vie et Mort de la Bête du Gévaudan (1988), who proposed that the Chastels not only had trained the creature as a voracious killing machine but also, as with official war-dogs, had kitted it out in a thick leather armour-like harness that would have shielded it to a considerable extent from gunfire. Yet if this were true, survivors of its attacks as well as mere observers would surely have noticed and reported that it was wearing a harness? However, this does not appear to have been the case. 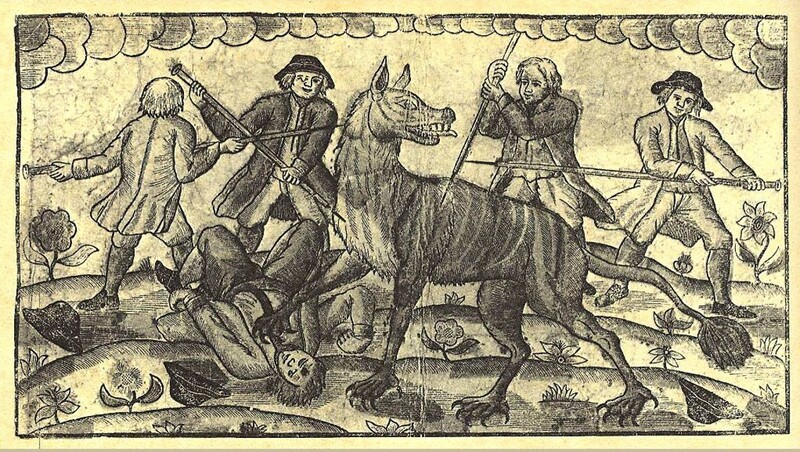 Yet another variation upon the human-based theory, as espoused in Loups Garous en Gévaudan – Le Martyre des Innocents (1995) by Pierre Cubizolles, is that one or more human sadists were indeed involved, and may even have donned wolf-skin costumes during their heinous actions, but belonged to the more elevated, aristocratic strata of society, and thus received protection and immunity from the authorities. Certain other investigators, however, favour an even more chilling explanation. 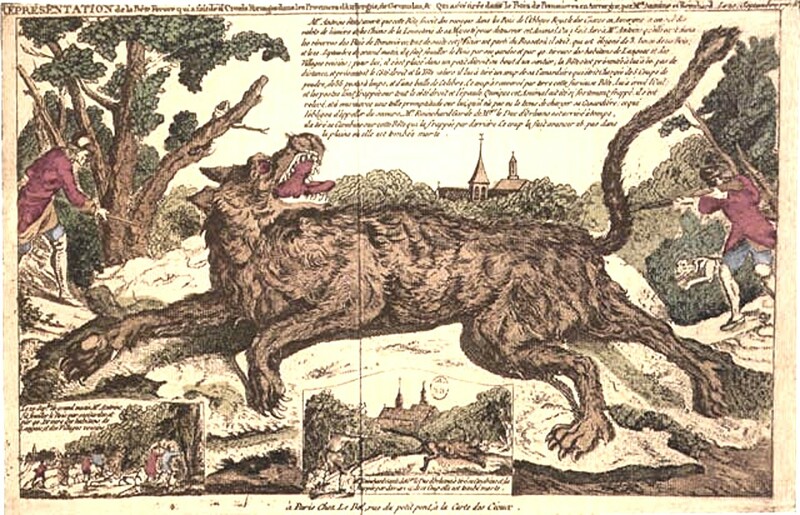 They propose that the Beast of Gévaudan was not merely a man in a wolf costume, but a bona fide loup-garou - a werewolf, committing its dreadful acts as a wolf, then transforming back into a man to avoid detection, with its identity quite possibly being that of Antoine Chastel, thereby meaning that neither of the shot creatures was the true Beast. Worthy of especial note in relation to this unsettling concept is the extraordinary encounter allegedly experienced in late August 1764, by a peasant woman from the village of Langogne in the Gévaudan district. According to her testimony as chronicled in various media reports from that time (how accurately, however, is another matter entirely! 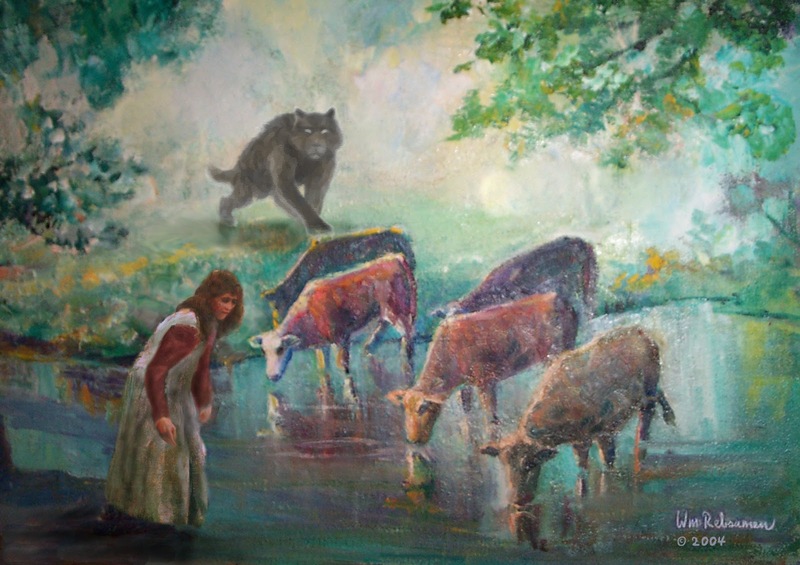 ), while accompanied by her cattle and dogs she had come upon a bizarre entity as big as a donkey, clothed in short reddish hair, sporting a long tail, short ears, and pig-like snout, but which walked on its hind legs like a man! Fortunately for her, however, it had been warded off by the cattle, which confronted it with sharp horns at the ready after it had succeeded in scaring away the dogs. It hardly needs stating that science views a wolf-man identity for the Beast of Gévaudan with great scepticism. In any case, straightforward non-transforming wolves/hyaenas or human sadists (or both) could certainly accomplish the Beast's horrific deeds, without the need for any lycanthropic intervention. 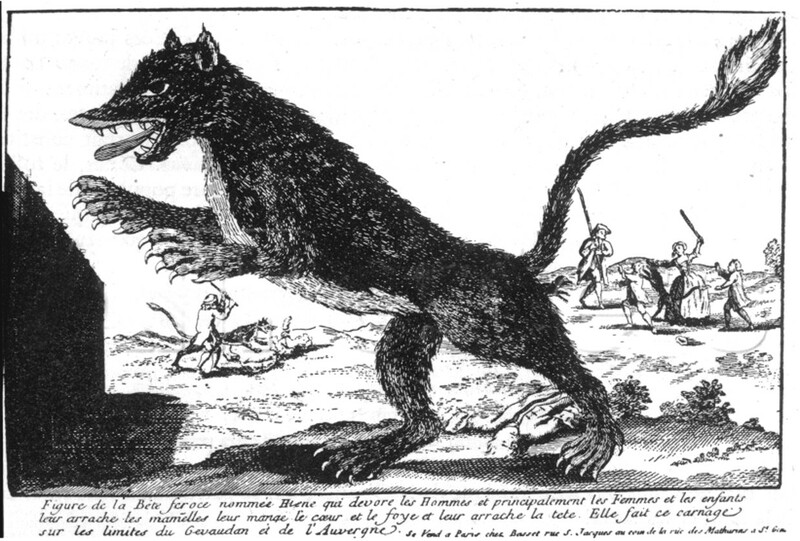 So what was the Beast of Gévaudan? Perhaps I should rephrase that question: what were – or even who were – the Beasts of Gévaudan? 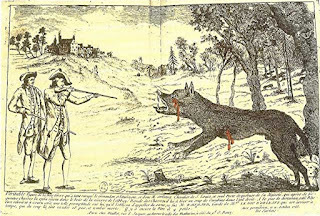 For there seems little doubt that more than one entity was involved here, and I don't just mean the two beasts shot respectively by François Antoine's party in September 1765 (either a wolf or wolf-dog hybrid) and by Jean Chastel in June 1767 (apparently a striped hyaena, judging from the museum's identification of it). To kill the numbers of people recorded during the Beast's three years of savage bloodshed would require several wolves at least, plus the hyaena, and the possibility that the Chastels were complicit in some form of murderous spree cannot be ruled out either. Consequently, as is so often apparent in the more involved cryptozoological cases, a composite explanation seems the most (indeed, the only) plausible one, cloaked in this instance by religious fear and ignorance, and conceivably fuelled by some degree of human evil too – not to mention a rampant, highly sensationalised media coverage, as evidenced by various of the overwrought contemporary illustrations from that coverage purposefully included in this present ShukerNature blog article, plus the bizarre media reports of the pig-snouted biped from August 1764. 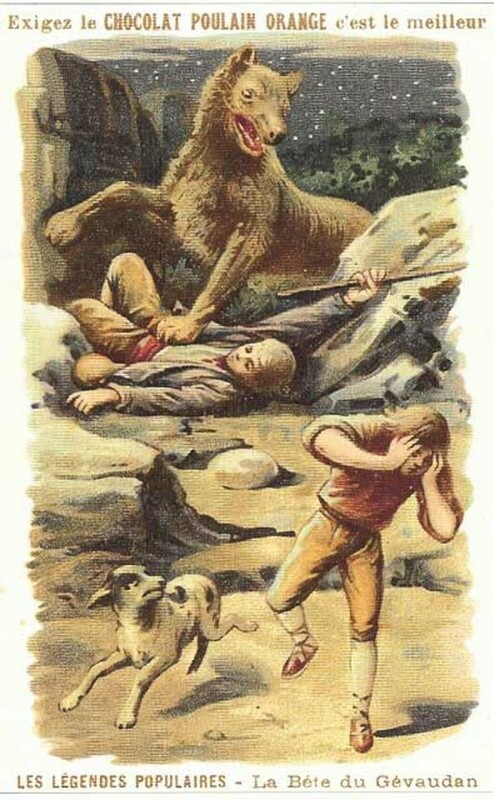 The real Beast, therefore, or at least a component of it, may indeed have been humanoid, and bipedal, but it was not a werewolf; instead, it just might have been one or more humans acting in a truly bestial manner, with beasts of the four-legged variety taking the blame for their vile, inhuman activities – although we will probably never know for certain. All that we can say for sure is that truth may indeed be stranger than fiction sometimes, but very often it can be a lot more complex too. 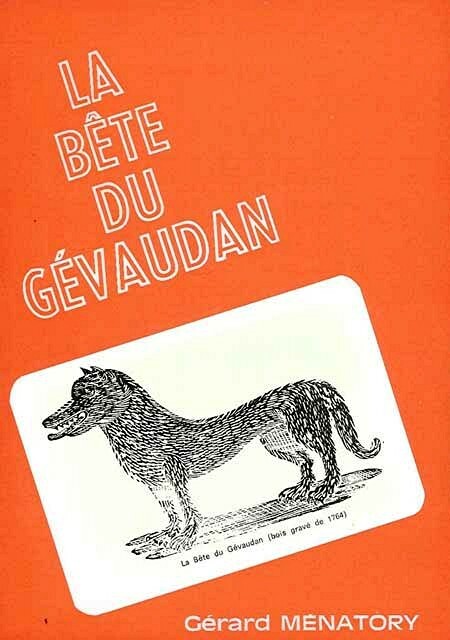 The Beast of Gévaudan has been the subject of over 30 French non-fiction books and numerous novels, not to mention works in other languages too – click here and here to see selections of these varied publications. This ShukerNature post is excerpted from my book-in-progress Dogs of Magic, Mythology, and Mystery – a canine companion to my earlier book Cats of Magic, Mythology, and Mystery. I enjoyed this article a lot. I’ve been interested in the Beast of Gevaudan for quite a few years now, in fact since seeing the film “ Brotherhood of the wolf”. This is one of the best pieces I’ve yet read on the subject. I first read about the Beast in Loren Coleman and Jerome Clark's book Cryptozoology A to Z about three years ago. This, however, is probably the most in-depth article I've ever read on the Beast. Great and very interesting, Karl. I look forward to your book about dogs. Your book about cats is a sumptuous masterpiece. Very best of luck with it. Thanks guys for your very kind words and I'm delighted that you enjoyed my article so much! ANTLERED ELEPHANTS - OR UNLIKELY UINTATHERES?